Meet Bug a boo! 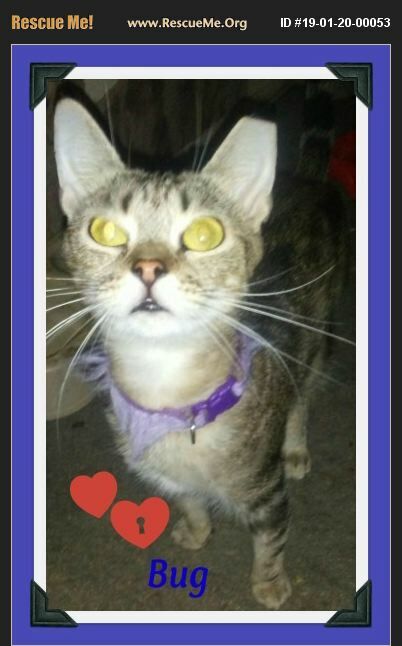 She is an adorable small medium brown tabby, with larger than life golden eyes. She has the signature 'M' on her forehead as all true tabbies do. She is snug as a BUG in a rug...as she loves to snuggle, be held, and be in your lap or near. Bug enjoys play time and sleeping with her humans. Then biscuits making will begin. Bug is around 10 to 12 months old, spayed, combo tested negative, up to date with her rabies and FVRCP vaccinations. Opps, lets not forget she is microchipped as well! This little doll is around 5 # to 6#s, a smaller gal with a heart full of love to offer a lucky human caretaker. She would love a kitty tower of some sort to gaze outside, and enjoys interactive toys where the ball goes round and round or through tunnels, also little soft balls and furry mice dipped in cat nip, if you please. Please contact us, to fill out an application and we will set up a meet and greet for a Bug you will want to keep a lifetime. We offer a two week trial adoption to make sure our little doll is a great fit in your family. We don't want you to keep her if you don't simply adore her! We load pictures new pictures weekly, come back soon, or tell us what type of kitty you are looking for. Thank you for visiting our Snow Camp rescue kitties.